The software solution for DNA, RNA and protein sequence alignment and analysis. DNASTAR’s Molecular Biology Suite is the comprehensive sequence analysis and alignment software you need to support your molecular biology research. The suite provides software solutions for DNA, RNA and protein editing and annotation, Sanger sequence assembly, multiple sequence alignment, virtual cloning, primer design and comprehensive sequence analysis. Streamline your workflow with automated plasmid annotation and large-scale batch editing; automatically concatenate, translate, reverse complement, or extract features from multiple sequences simultaneously. Translate DNA or back translate protein using the genetic code of your choice. Find out why users worldwide recognize DNASTAR as a leading sequence alignment software for life scientists. Choose from a variety of molecular cloning techniques: Gateway cloning, Gibson Assembly, GeneArt cloning, In-Fusion cloning, TA cloning, TOPO cloning and restriction enzyme cloning. Predict coding regions and intron or exon boundaries files for splice sites, start sites and transcription factor binding sites. Align known genes, expressed sequence tags (EST) or proteins with your sequence. Batch annotate your sequences, match plasmid features and replace existing features from the plasmid vectors database. PCR primer and QPCR primer design software for primer analysis, primer checks, and sequencing primers with a customizable primer database. View the effect on key characteristics such as primer melting temperature or primer annealing temperature. Sequence assembly and sequence analysis of Sanger sequencing data. Assemble data de novo or against one or more reference sequences and use dna analysis tools to view sequence alignment, SNPs analysis and annotate the consensus sequence. DNA, RNA, and protein sequence alignment tools using a range of pairwise alignment and multiple sequence alignment methods. Use the phylogenetic tree maker from the generated sequence alignments. Manually edit saved DNA or protein sequences or download a sequence directly from NCBI GenBank. Control and customize expression-specific genetic codes for translating and back-translating sequences, reverse complement, invert, translate and ORF identification. Do you need software primarily to design a primer or for dna cloning? SeqBuilder Pro is the best cloning software for users who need a comprehensive primer design or cloning solution without additional software integrations. The only application from DNASTAR that you can buy individually, now available to purchase online. Visit seqbuilderpro.com to buy today! 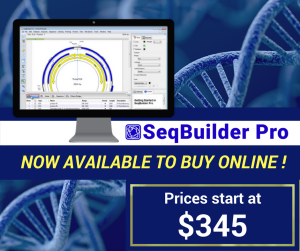 SeqBuilder Pro (formerly SeqBuilder) is DNASTAR’s software application for designing primers, virtual molecular cloning and analysis of dna sequences. Plasmid mapping software and plasmid drawing tools included. GeneQuest is DNASTAR’s software application to locate and annotate genes, regulatory elements and structure for complete DNA sequence analysis. Display restriction sites and agarose gel separations of restriction digests. Predict intron boundaries with pattern files for the transcription factor binding site. 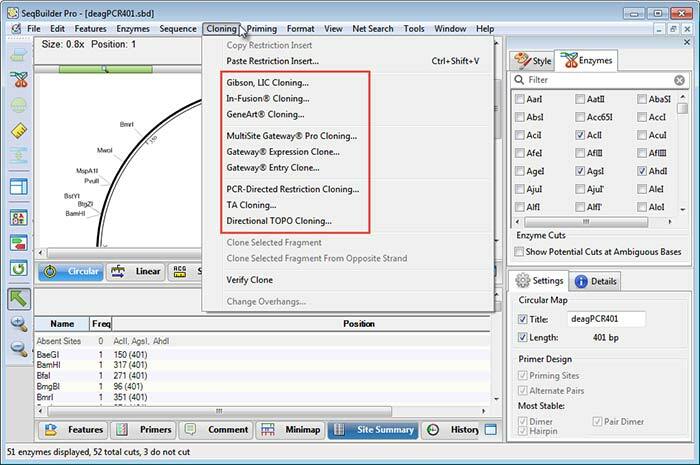 PrimerSelect is DNASTAR’s software application with primer designing tools for adjusting mispriming parameters and creating a primer catalog. View primers with the restriction map, reading frames and genetic code translator. Export primer sequence and use BLAST primer search. MegAlign Pro is DNASTAR’s software application to perform multiple sequence alignments of large DNA, RNA, or protein sequences and provides four alignment methods: MUSCLE, Mauve, MAFFT, and Clustal Omega. MegAlign is DNASTAR’s software application providing both DNA and protein sequence alignment using a range of pairwise sequence alignment and multiple alignment methods. Use bootstrapping to test for consistency and robustness of phylogenetic trees created using one of the Clustal methods. GenVision is DNASTAR’s software application for genome visualization, designed to support easy generation of publication quality graphics of annotated genomes. Customize to compare gene functionality, illustrate gene expression levels or visualize coverage of an assembled contig. SeqMan Pro is DNASTAR’s software application for sequence assembly and analysis of Sanger sequencing data with comprehensive SNP analysis, also providing variant analysis with annotation. Discover variants and annotate. SeqNinja is DNASTAR’s software application for automated and batch editing of genome sequences, supporting a variety of file types. Generate a multi-sequence FASTA file by extracting features, generating a reverse complement dna sequence, or translating a GenBank file. EditSeq is DNASTAR’s software application to manually edit saved DNA or protein sequences or download a sequence directly from NCBI GenBank. Control and customize expression-specific genetic codes for translating and back-translating sequences, reverse complement, invert, translate and ORF identification. Watch the overview of DNASTAR’s Molecular Biology Suite to learn more about the included applications to design PCR primers, align multiple sequences, clone a gene and more. Essential sequence alignment software for DNA primer design, molecular cloning and complete DNA sequence analysis.